Heat oven to 325°F. Line 13x9-inch pan with foil, leaving 2 inches of overhang on each side for handles. In food processor, crush cookies to fine crumbs. Transfer to medium bowl, and stir in 1/4 cup melted butter until combined. Press mixture firmly in bottom of pan. Bake 8 to 10 minutes or until crust is just set. In large bowl, beat cream cheese and sugar with electric mixer on medium speed about 1 minute or until smooth. Add cornstarch and espresso powder; beat until combined. Reduce speed to low, and beat in eggs, one at a time. Beat in vanilla and Irish cream liqueur until just combined. Spread mixture evenly over crust in pan. Bake 30 to 35 minutes or until cheesecake is set around edges but still jiggles slightly in center. Cool 1 hour on cooling rack. Refrigerate 2 hours to set. Place chocolate chips in medium bowl. In 1-quart saucepan, heat whipping cream and 2 tablespoons butter just to boiling over high heat. Remove from heat; pour mixture over chocolate chips. Stir until chocolate is completely melted and mixture is smooth. Cool 10 minutes; pour and spread chocolate mixture evenly over chilled cheesecake. Refrigerate 1 hour to set. Use foil handles to carefully remove bars from pan. Cut into 9 rows by 4 rows. 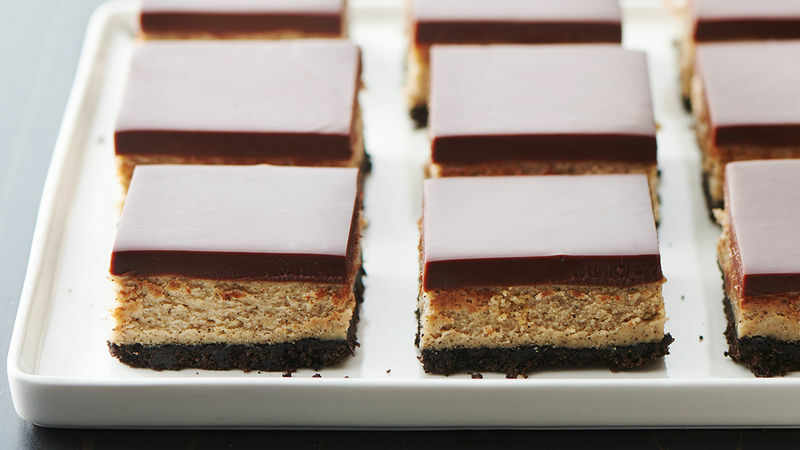 Use a sharp, clean knife to cut cheesecake into bars. It helps to wipe the knife after each cut.